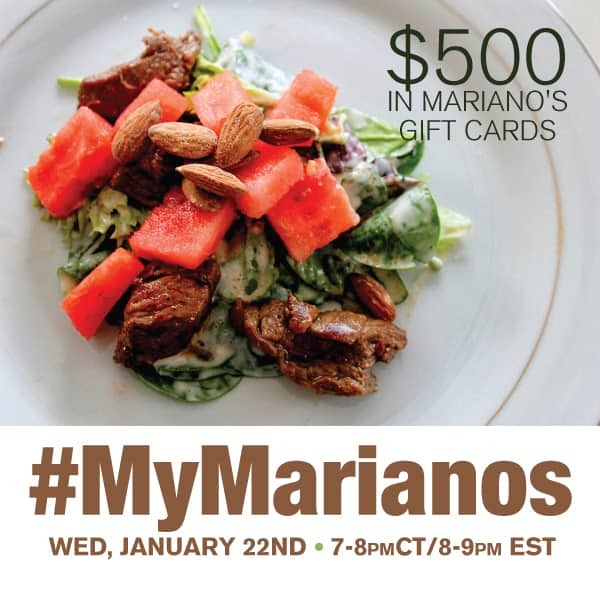 Join Me at the #MyMarianos Twitter Party! Great prizes for Illinois residents! Planning to eat healthier for the new year? I am sure many of us have vowed to do so. It can be a little overwhelming and difficult to know where to start. Mariano’s realized this and has developed a new way to help us shop easier and healthier. The new health key™ system at Mariano’s is designed to help those who have diet restrictions or that simply would like to eat healthier. I mentioned it in my previous Mariano’s Post where I talked about my recent dietary changes and shared Paleo Gingerbread Muffins recipe. Let’s talk wellness, nutrition, recipes and fitness during the #MyMarianos twitter party! Join myself, @xokammie, along with @sweeptight, @thedomesticexec, and @3girlsmomma19 for a fun chat. *PLEASE NOTE: All are welcome to to join party. Only residents of Illinois are eligible to win. New to Twitter Parties and want to learn more? sign up for SoFabChats Twitter Party email alerts! and learn how you can enter to win our special Early Bird gift card prize!